For those who really want luxury and are not interested in the more traditional boats - this offers similar experience but with more modern cruise feeling. 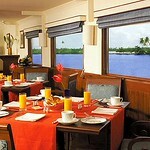 The expansive backwaters of Kerala and an enjoyable backwater cruise are veritable attractions in any Kerala itinerary. 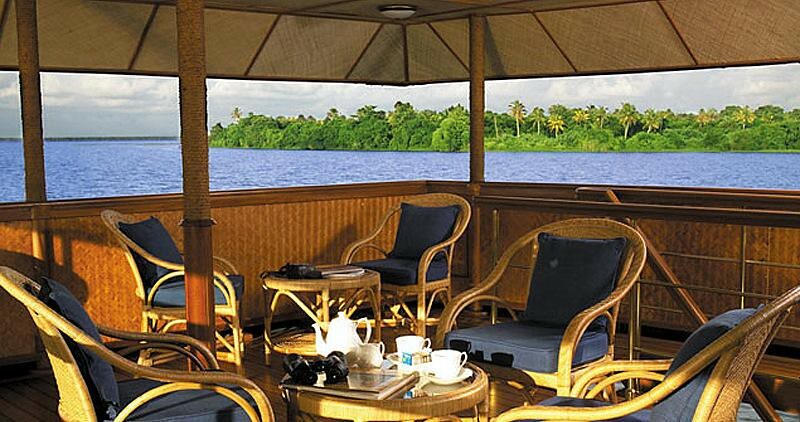 The Oberoi Motor Vessel Vrinda, Backwater Cruiser is a great option to soak up the fun and charm of the backwaters. The guests can indulge in a 3-night and 4-day journey through the tranquil waterways and sets sail from Vembanad Lake jetty, located 45 kms from the city of Cochin. The cruise bring the guests up close to the natural finery, bucolic village settings and quaint glimpses of the tiny hamlets on the river banks as the cruiser meanders through a series of picturesque canals and lakes. This exclusive cruiser has eight tastefully appointed Luxury Cabins, all with king size beds and large picture windows overlooking the lake that allow you to steal a glimpse of the backwaters right from the bed. 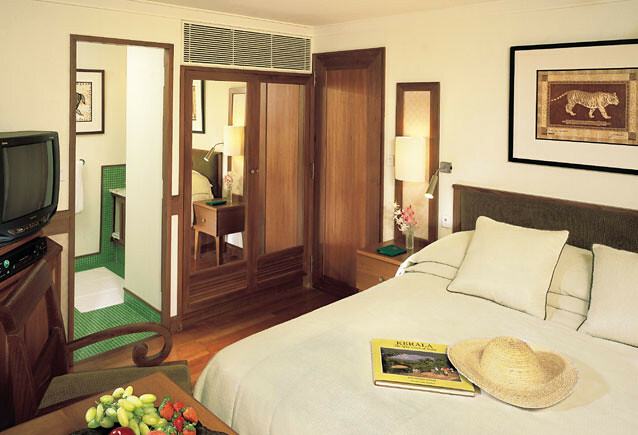 The Cabins are done up in an elegant wooden theme and has a rich timber flooring. Each cabin has its own private and well-appointed bathroom with shower apart from comfortable furniture, TV and DVD player and an electronic safe. 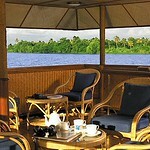 At 1 p.m., once all guests are on board, Vrinda sets sail along the main waterway on Vembanad Lake and enters the Alleppey canal. Lunch will be served on board.The cruiser sails along the scenic waterways for four hours and returns to the Vembanad Lake in time to watch the sunset. Later in the evening, guests enjoy a performance of the highly ritualized “Kathakali” dance which tells stories from the ancient Hindu epics - Ramayana and Mahabarata. Performances begin with the application of elaborate makeup which is based in traditional Ayurvedic principles.The vessel will anchor for the night at the Vembanad Lake jetty. Dinner on board. At 7 a.m., Motor Vessel Vrinda will sail from the Vembanad Lake jetty and head South, towards Alleppey. Breakfast will be served on board. The vessel will enter the waterways of the Pamba river through the Alleppey canal. Sailing through scenic backwaters, guests can observe life along these “water highways” while passing through one of the few areas in the world where farming is done below sea level. The vessel will anchor near Kanjippadam and guests will be transferred to a traditional rice boat to navigate through the narrower sections of the backwaters. For the next few hours, guests will observe and experience a way of life unique to this region, accompanied by a guide. This section of the cruise includes a visit to the half-statue of Lord Buddha at Karumadi and a traditional Kerala tharavad (family residence). Later in the day, guests return to Motor Vessel Vrinda where lunch will be served as the boat passes through picturesque stretches of the backwaters on the way back to Alleppey, known as the “Venice of the East”. Motor Vessel Vrinda will anchor for the night at the Vembanad Lake jetty. Dinner on board. At 7 a.m. Motor Vessel Vrinda will sail from the Vembanad Lake jetty and head South, past Kanjippadam. Vrinda will anchor near Chambakulam where guests will transfer onto the rice boat once again for a pre-lunch sightseeing excursion. Guests will visit St. Mary’s Church, established by St. Thomas in 1721 and Sree Bhagavathy Kshetram – a 100-year old Hindu temple to Mother Goddess - at Nedumudy. Guests can also explore the Chambakulam snake boat yard, which displays one of the traditional long snake boats used in races. To further the understanding and appreciation of this experience, a qualified guide will be present on board for the full day After cruising through the backwaters in the afternoon, Motor Vessel Vrinda will return to Vembanad Lake, where guests can enjoy a “Mohiniattam” recital on board. This classical dance form, distinctive to Kerala, is also called the 'Dance of the Enchantress'. Dancers attired in beautiful traditional costumes perform with slow, graceful movements and highly emotive expressions. Dinner on board. At 8 a.m. Motor Vessel Vrinda will sail North along the main waterway channel on the Vembanad Lake. Breakfast will be served on board following which the vessel will return to the Vembanad Lake jetty. 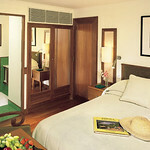 Guests will check out at 10.00 hours and will be transported by air-conditioned vehicle back to Cochin. The upper deck houses a lounge and bar with panoramic views of the backwaters. The breakfast served on the sun deck at sunrise creates a magical ambience of peace and serenity. Enjoy a cup of traditional cardamom tea sitting on cushions or wicker chairs watching the tropical world float by. 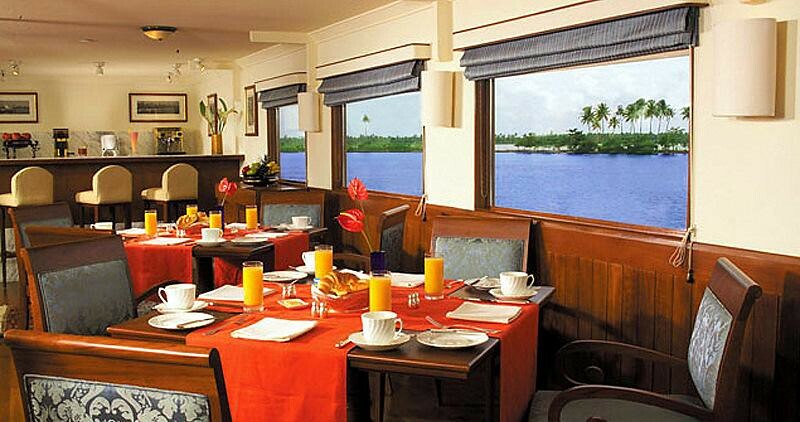 Motor Vessel Vrinda can proudly boast of her International and South Indian cuisine. At each meal, the well-trained crew works with you to create a unique menu. The area is rich with coconuts, bananas, rice, local freshwater fish like pearlspot and small red prawns called Chemmen, which make for innovative recipes like Meen Moily and Malabar fish curry.Indulge in this boat’s other signature dishes like Crab and orange salad, Masala prawns and Espresso cheese mousse. In the event of cancellation or any changes in any any itinerary, due to unavoidable reasons, the guests are not entitled for any claim. With effect from 2nd October 2008, the Government has introduced "No-Smoking" legislation for hotels, restaurants and all public places. As a consequence, smoking is prohibited in the Deluxe Cabins. However, designated smoking area is available onboard.